Mexican Malbec Cab Blend ¡Verdad! 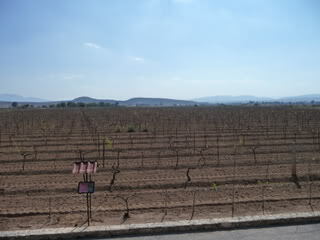 The Curpeata Agave field on the outskirts of Morelia in Michouacan. A gorgeous place, have no idea how I got here but I’m glad I made it back. I recently returned from an agave spirit hunt in Mexico. Long story short, I found some amazing Tequilas and Mezcals, perused the blue agave and cupreata fields of Jalisco and Michouacan, toured distilleries and spoke (gringo 7th grade Spanish) with master distillers about their craft. Blue Agave in a field in Arandas, Jalisco MX. Notice the red soil. Rojo loco es perfecto para Tequila! My favorite way to enjoy Tequila and Mezcal – banderas con queso. You sip the agave spirit first, then the lime juice then the Sangrita tomato juice concoction. The spiced salt, naranja and aged Cotija Cheese is an added treat. Mexicans are true gastronomes. “In the past it used to be called vino de mezcal, or mezcal wine,” says Yira Vallejo, director of Mezcal From Oaxaca. “So if in wine you have grapes and you have different names like Pinot Noir, Merlot, Sauvignon Blanc, in mezcal, you have Madrecuixe, Tobalá, Espadín, Largo, Cirial, Tripón, Barril—150 names.”* If you want to learn more about “Tequila’s rustic cousin” as Rick Bayless describes mezcal, click here to read a well done, succinct explanation on epicurious.com. Well, I’m not disavowing my wine blogging for agave spirits anytime soon. I was intent on finding a Mexican wine for under $10 USD or $140 pesos while perusing agave spirit brands in the bodega. Good news, not too difficult. But finding a wine in the appellation I was visiting was tricky. 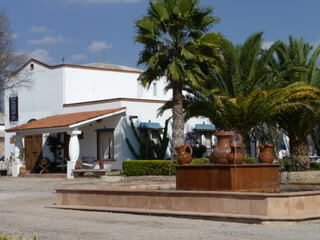 Jalisco is the Tequila capital, not really a wine growing and producing region. 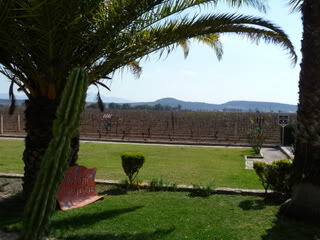 There are three main wine growing areas in Mexico, the central region (Querétaro), the La Laguna area (Coahuila) and the northern and most popular wine growing region (Baja California). ** I am totally unfamiliar with Mexican wines, so when I finally found a generous selection of wines from Mexico (tequila selections have wine beat 4 to1) I chose a bottle by varietal. Based upon my experiences with Argentinian Malbecs and their success in similar arid topographies, I deducted that a Malbec/Cab blend from the central wine growing region of Querétaro should suffice. Charm x1000! I’m in love with the Spanish influenced Mexican architecture – it always makes me smile and feel as warm as a shot of the good stuff. 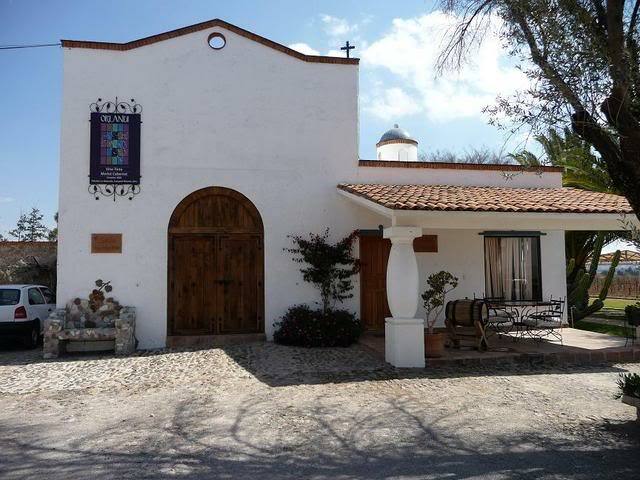 The La Redonda winery epitomizes Mexican charm and the grace of simplicity. Imagine the view with grapes in full fruit, which explains why that cactus is so attentive! La Redonda winery is located near Tequisquiapan, a “beautiful” village about 2 hours north of México City as described by Degrandcru on Snooth.com who wrote a great description of the area with pictures of La Redonda’s expanse vineyards and charming winery. These pictures are from the review provided by Degrancru and they epitomize the simple charm that I too experienced in small distilleries where very special spirits were produced and sold across the country. My ignorance of Mexican wine and it’s potential did not give me much promise. Good news – this wine was very delicious. Light, fruit forward with berries, a little cinnamon spice, very balanced with a soft finish. It was not as chewy as some Malbecs can be and not as bold as most Cabs. 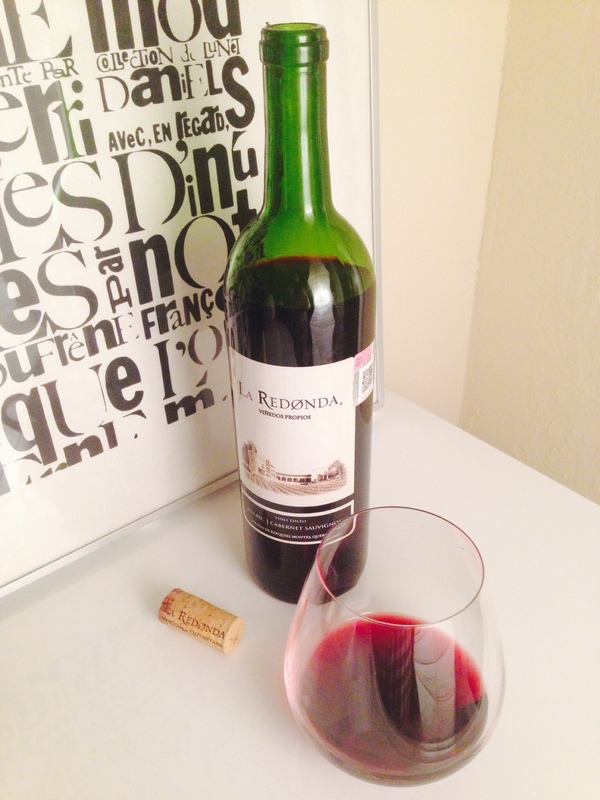 The blend reminded me more of a Spanish Rioja that you would drink profusely with tapas. I found it to be highly drinkable and perfect for everyday. I rate it a buy again – so bring on the carnitas, huit la coche, escamoles, molcajete guacamole and some tortillas por favor! This is a wine that is great at both starting a meal and a conversation. I suggest taking a chance on a Mexican wine, remember, the same padres who founded the industry in California started the North American wine making tradition in Spanish colonial Mexico. Although their industry is small by comparison, todays Mexican wine makers have a heritage rooted in centuries of experience. Let’s face it, their only obstacle was that Tequila stole the show. Buen provecho! ← A Brut Rosé For Valentine’s Day & A Pink Dinner Extravaganza! I don’t drink tequilla; it makes my clothes fall off. However, I would love to try Mexican wine! I have read the industry is growing. I have never had Mexican wine. Do they distribute any to the US. You would think in TX I should be able to find some if it is here. Thank you for another educational and entertaining article! I can’t say I’ve ever felt a strong desire to explore Mexican wines, but I’m glad you had such a good time with it! Tequila does not make my clothes fall off like Michelle, but there may have been one evening several months ago where it did lead to me getting sick in public. I think it’s just safer for me to stay away from all Mexican alcohol.